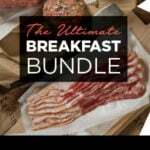 Coupon: Save $50 over your first two boxes! New customers only. No coupon required, just use this link. The produce was packed atop a cardboard divider, beneath which was a nest of ice packs. 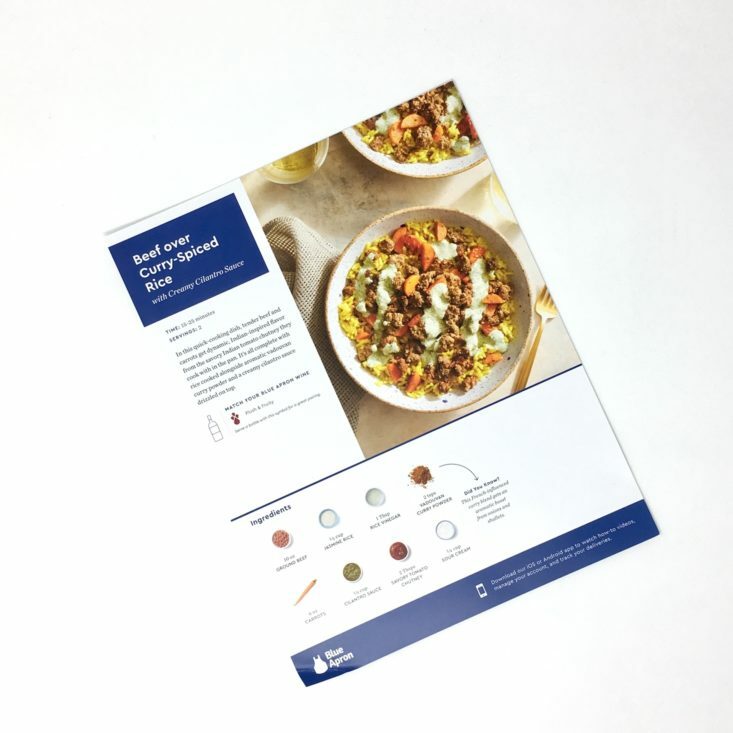 A lot of the ingredients from Blue Apron come in bags, labeled, but you have to check out the recipe cards to know which meal they go to. Smaller items like butter or sauces come in a “knick knack” bag so they don’t get lost in the shuffle, and those are labeled with the meal’s name as well. The plastic bags are the same as the ones larger ingredients come in and are also recyclable. There were no advertisements or info cards in this month’s box. After unboxing all of the ingredients, I separated each meal into its own plastic grocery bag for storage in the fridge, so nothing got lost or accidentally incorporated into another dish. To start, I added the rice, most of the curry powder, a big pinch of salt, and 1 cup of water into my rice cooker. It’s a great alternative to potentially ruining rice on the stove, as I’ve done far too many times before. Oh, and it also works best if you remember to turn the rice cooker on. I didn’t until about 10-15 minutes into the recipe, but it all worked out in the end. I heated a drizzle of olive oil in a large non-stick pan on medium-high heat before peeling and chopping these two carrots into little half moons. Into the heated pan, I added the ground beef and sliced carrots, then seasoned them both with salt and pepper. This all cooked for 7 minutes while I broke the ground beef apart and kept things moving around. In a small bowl, I quickly whipped together the sour cream, cilantro sauce, and vinegar, then sprinkled in a little bit of salt and pepper. Naturally, I snuck a little taste, and it was great. So great, I may have snuck three or four more tastes. No, I didn’t eat all the sauce before the dish was done, but I easily could have if not for some willpower. Once the beef had cooked all the way through and the carrots had softened, I added the tomato chutney with two tablespoons of water. I also snuck a taste of the tomato chutney to see what it was all about, and it blew my mind. It had the robustness of tomato paste, with a slew of hot Indian spices. I found it online, in case you’re interested. I’ll be purchasing a jar for myself, because yes, it was that good. Here’s my finished rice, looking wonderfully yellow and smelling incredibly fragrant. I should make curry rice more often—it’s really easy! I present to you: the easiest Blue Apron meal I’ve ever made. I could have whipped it together in 20 minutes had I remembered to turn on the rice cooker sooner, but that’s my own fault. Anyway, this dish was so delicious. The flavors were bold and impactful, and I couldn’t get over how simple it was to create something so tasty. The calorie count was a little high, so when I recreate this dish down the line, I’ll make a few simple moderations to get that number down. If you see this dish pop up in your meal rotation anytime soon, ORDER IT. Blue Apron has been recreating famous dishes from around America the past few weeks, and this particular dish is from that endeavor. Like the last meal, it’s a bit high in calories, but I knew what I was getting into. I preheated the oven to 450 degrees, lined a large sheet pan with foil, and added my potato wedges with salt, pepper, and a drizzle of olive oil. These roasted skin-side down for 20 minutes. With the potatoes in the oven, I sliced the baguettes in half. Upon coring the cabbage and thinly-slicing its leaves, I tossed it with the vinegar, creamy mustard sauce, and pickle relish, then seasoned it with some salt and pepper. This sat to marinate for the duration of the cook time and received an occasional stir. In a very large bowl, I combined the flour with all but a pinch of the spice blend, plus salt and pepper. It was mixed well before adding in the chicken. Imagine my delight when I discovered the packaged chicken wasn’t a breast, but pre-sliced pieces! Hooray! I patted them dry with paper towels, gave them the salt and pepper treatment, and prepared them for the flour. Before tossing all of the chicken into the seasoned flour, I began warming a large non-stick pan with a drizzle of olive oil. That way, the chicken would have a place to go, and the operation could continue moving full steam ahead. After shaking off any excess flour, I added the chicken to the hot pan to cook for 4-5 minutes. Mmm, that color. In a small bowl, while the chicken was doing its thing, I mixed together the mayo with the leftover pinch of cajun spice blend and, you guessed it, more salt and pepper. When the potatoes finished roasting, I added the baguettes to the pan. They received a quick spray of canola oil, plus some salt and pepper. Should I dial back all the seasoning? Probably. Anyway, the sheet pan went back into the oven for another 7 minutes for the baguettes to toast. And voila, my finished sandwich in all its glory. Overall, it was pretty good. Was it as spectacular as the previous dish? Nah. Would I go so far as to say I wouldn’t recommend it? Nope. It was nice. The slaw was savory and sweet, not to mention abundant. My boyfriend and I enjoyed what didn’t fit on our sandwiches as a side dish, which was more than half of the slaw and a few spoonfuls of chicken. The potatoes were well roasted, and the chicken had a lot of cajun flavor. As much as I like the baguettes from Blue Apron, I wish they could hold fillings better. That aside, this one was a-okay. Verdict: My experience with Blue Apron this month was positive. The curry rice dish blew my mind, both with its flavor and how little time it took me to throw together. The chicken sandwiches were all right, but not nearly as exciting as the other meal. It’s been nice having specialty dishes like these on busy nights, so while I wouldn’t use Blue Apron in place of going to the grocery store every week, I would recommend it for an occasional, indulgent home cooking experience. Coupon – New customers, save $50 off your first two boxes! No code needed, just use this link. Check out all of our Blue Apron reviews and find the best meal delivery kits of 2019! What do you think of these Blue Apron recipes?